Sheep production systems in Brazilian caatinga rangelands require supplementation adapted to changes in floristic and chemical composition as dry seasons progress. Meeting sheep nutritional needs in extensive semiarid systems is challenging because of sheep dietary preferences and habits. The objective of this trial was to evaluate the substitutive effect of concentrate supplementation on grazing sheep in the Brazilian caatinga rangeland and its consequences on performance in different seasons. The trial was conducted from March to August 2013 at Embrapa Goat and Sheep in Sobral, Ceará State, Brazil. 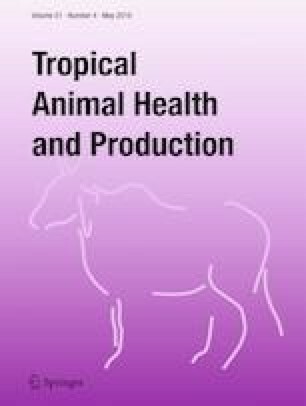 Thirty-two Brazilian Somali multiparous ewes were submitted to estrus synchronization and controlled breeding. At the start of the trial, ewes averaged 30.45 + 2.60 kg body weight (BW). Ewes were divided into four groups and individually offered 0, 200, 350, or 500 g supplement head−1 day−1. Intake prediction and digestibility trials were evaluated at three periods: rainy season (April), transition rainy-dry (June), and dry season (August). Sheep weights were taken every 14 days to measure their performance from late gestation until weaning. Ewe BW and body condition score changes were determined too. Lamb BW changes were also measured every 14 days from birth through weaning. A completely randomized design with split plot arrangement using eight replications was used for intake and digestibility measurements. The differences between supplement offered (0, 200, 350, and 500 g sheep-1) and season (rainy, transition rainy-dry, and dry) were submitted to analyses of variance and multiple means were separated, where differences were detected, using the Tukey’s test. During lactation up through weaning, ewes supplemented at 500 g day−1 had greater BW than ewes without supplement. Ewes supplemented with 200 g concentrate head−1 day−1 had 9.1% greater (P ≤ 0.05) BW at weaning and their lambs had 19.7% greater birth and 16.6% heavier wean BW despite lower dry matter intake compared to unsupplemented animals. Supplementation with 200 g concentrate increased carrying capacity by 28.8% during the dry season and by 20.5% during the rainy season. This study confirmed that in the dry season, when quality of rangeland forages decreases, supplementation contributes to greater DMI, improves postpartum and lactation BW recovery of ewes, and contributes to greater lamb birth and wean weights. Moreover, supplementation leads to feed substitution effects that may increase rangeland resilience by mitigating overgrazing. Supplementation with 200 g concentrate can also prevent negative energy balance for grazing animals, improving longer postnatal recovery, longer intervals between parturitions, fewer double and is necessary to ensure a better BW at birth to lambs. This study received financial support from FUNCAP (Fundação Cearense de Apoio ao Desenvolvimento Científico e Tecnológico), Embrapa and CAPES (Coordenação de Aperfeiçoamento de Pessoal de Nível Superior). All applicable international, national, and/or institutional guidelines for the care and use of animals were followed. The experimental protocol was approved by the Animal Ethics Committee at Embrapa Goats and Sheep, Sobral – CE, Brazil, registered with the number 01/2013. The authors declare to the proper purposes that the experiments comply with the current laws of Brazil, where they were performed. Informed consent was obtained from all individual participants included in the study. Araújo Filho, J.A. Manejo pastoril sustentável da Caatinga. Projeto Dom Helder Camara. 2013. http://www.cstr.ufcg.edu.br/ppgz/manejo_pastoril_sustentavel_caatinga.pdf Accessed 06 Mar 2018. Ferreira, E.B., Cavalcanti, P.P., and Nogueira, D.A., 2014. ExpDes: An R package for ANOVA and experimental designs. Applied Mathematics 5, 2952–2958. https://doi.org/10.4236/am.2014.519280. Instituto Nacional de Meteorologia - INMET. Dados históricos de Sobral, CE em 2013. INMET. 2014. http://www.inmet.gov.br/portal/index.php?r=home/page&page=rede_estacoes_auto_graf Accessed 06 Mar 2018. Magalhães, A.F.B., Facó, O., Lôbo, R.N.B. and Vilela, L.C.V. Raça Somalis brasileira: Origens, características reprodutivas e desenvolvimento ponderal, 2010. https://ainfo.cnptia.embrapa.br/digital/bitstream/item/31710/1/UMT-Documentos-99.pdf Accessed 06 Mar 2018.